Tioman Island is the largest island on the east coast of Malaysia and is one of Malaysia’s biggest tourist resort areas, popular with both locals and international visitors. There are many accommodation options to choose from with backpacker beach huts up to luxury five star resorts. Tioman Island can be reached by ferry or flight from the mainland. Tioman Island has a variety of dive sites all protected under marine park status. There are sloping reefs, pinnacles and wrecks. Marine life is prolific with manta rays and whale sharks seen in season. Most of the best sites are off small islands to the north west of Tioman Island. The majority of diving is done by daytrip dive boat with one of the number of dive centres on the island. There are occasional liveaboard trips to the area and other east coast islands. Tioman is best dived between the April to September dry season. Chebeh Island has several good dive sites but the most popular spots are at the north east and south east corners where large volcanic rocks form beautiful formations down to 30m deep. There are valleys, canyons and some swim-throughs and the southeast point has a large cavern filled with fish life at 20m depth. Walls are covered with colourful soft corals, barrel sponges and gorgonian sea fans. Currents can be strong here, attracting schools of barracuda and jacks. April and May are good months to spot whale sharks here. Manta rays can also be spotted. Tulai Island is also known as Fan Canyon because the dive site is full of large gorgonian sea fans that grow on the volcanic rocks. There are several dive sites around the island. Encrusting sponge and soft coral covers the rocks and marine life includes snapper, fusilier, wrasse, sweetlips, lionfish and scorpionfish to name just a few. Ribbon eels can be spotted here. There are several swim-throughs formed by the boulders. Maximum depth here is 25m and currents can be strong either side of a full moon. Visibility ranges from 5-20m. Labas Island, to the south of Tulai Island, is another rocky boulder dive site with lots of swim-throughs, caverns and caves. There are also coral garden beds covered in all the usual tropical reef fish. This is a good macro dive site and a torch is useful for highlighting critters in all the cracks and crevices. The maximum depth is 23m and currents are normally mild. Visibility ranges from 5-20m. Tiger Reef is a submerged reef in the channel between Sepoi Island and Labas Island. It’s maximum depth is 25m. It is regarded as one of the best reefs around Tioman with healthy hard and soft coral formations plus seafans, sea whips and crinoids. Black tip reef sharks can be seen at the reef edges and barracuda are often seen in the blue. Schools of snapper and fusilier are prolific as are trevally, soldierfish and surgeonfish. Currents can be strong at this dive site. Sepoi Island has some other diving options around the volcanic boulder formations that descend underwater from the islands edge. These can make very nice drift dives. Visibility ranges from 5-20m. Marine Park Wrecks. South of Soyak Island, located off the beach at the marine park HQ, are eight wrecks that are very close together and can be dived from one to one. Coral covers the wrecks and a large amount of marine life has made it’s home on them. Schools of snapper, fusilier and trevally are numerous as are lionfish and well camouflaged scorpionfish. The Pirates wreck at 18m deep is covered in sea fans and is a nursery for many juvenile fish species. The Sawadee wreck lies in deeper water at 30m and is home to various fis, invertebrates and crustaceans. Real stonefish can be seen here. Currents are normally mild here. Soyak Island is a small island just a 15 minute boat ride out from Salang Bay on the west side of Tioman Island. Submerged boulders around the island are covered with hard and soft corals that attract a myriad of marine life including harlequin sweetlips, blue ringed angelfish and batfish. Maximum depth is 25m. There are two small wrecks her which are also covered in soft coral and attract black tip reef sharks. Visibility is between 5m and 15m. Renggis Island is a small tree covered island off the west coast of Tioman Island that offers some of the best diving in the area. Just 20 minutes boat ride away it is popular with Tioman dive centres and is often used for training dives. Boulders descend from the surface down to 20m. On the eastern side the rocks are covered in corals, gorgonian seafans and barrel sponges. Anemones are home to various anemone fish species including Clark’s anemonefish and the western clownfish (Nemo). Anthias and damsel fish dance around coral heads. Schools of snapper and fusilier are grouped over the reef. Turtles can be found feeding on the coral and shy black tip reef sharks can be seen. This is also a popular spot for night dives when parrotfish can be seen asleep in their protective cocoon and crustaceans like crabs and shrimps are numerous. The more exposed west side of the island is covered with gorgonian sea fans. It is home to Boris the giant barracuda and several turtles. Away from the island in deeper water are two Thai wooden fishing boat wrecks and a small reef full of life. Black spot moray can be seen here as can batfish. Slightly deeper at 20m is the Tom Yam wreck which is a popular night dive to spot banded boxer shrimps and hingebeak shrimps as well as crabs, scorpionfish, lionfish and moray eels. Bahara Rocks is located 25 minutes boat ride south west of Tioman island and is another favourite dive site with the local dive centres. Boulders that drop off to 27m are covered in colourful red and purple soft corals, black corals, hard coral formations, anemones, seafans and barrel sponges. All the usual reef fish are here including emperor angelfish, sweetlips, wrasse, surgeonfish and soldierfish. Colourful anthias are always on the move. Pufferfish and porcupine fish can be seen in coral shelters and moray eels are found in shelters, including white eyed morays and giant morays. Visibility can be as good as 30m. Strong currents attract bigger fish such as barracuda. Reef sharks are often seen around the deeper rocks particularly in the mornings. 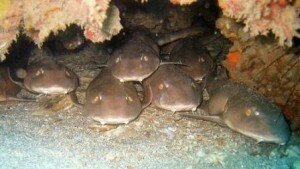 Stingrays can be seen in the sand at the bottom of the reef.